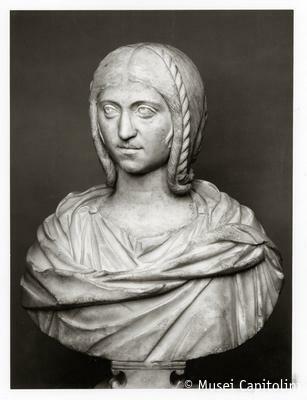 This female bust is cut below the bosom and is clad in a tunic and cloak. The woman’s face, turned to right, is marked by captivating, wide-open eyes, tight lips and a receding chin. The elaborate hairstyle is quite remarkable. The hair, parted in the middle, is arranged in a linear pattern and tied back on the nape in a wide braid, rolled up in a wide round bun. A second braid, that stems from the hairdo, adorns the top of the head. The sculpture dates back to the Severian age. Formerly in the collection of cardinal Alessandro Albani, the bust was acquired for the Capitoline Museum in 1733. Before being moved to the actual location, the sculpture was displayed in the Salone of the Palazzo Nuovo.